Introducing Another Highly-Customizable Product, Viroshades, Used For Functioning and Decorative Applications. With new creative method and manufacturing, Viroshades was created from the most natural looking synthetic blades of bamboo. In recent years, these synthetic alternatives to natural bamboo have been gaining popularity because of the current trends towards using more environmentally friendly building material and also easy to maintenance. Currently, Viroshades is available in Honey Bamboo color. Each specific set of shades may be specified with particular widths of blinds. 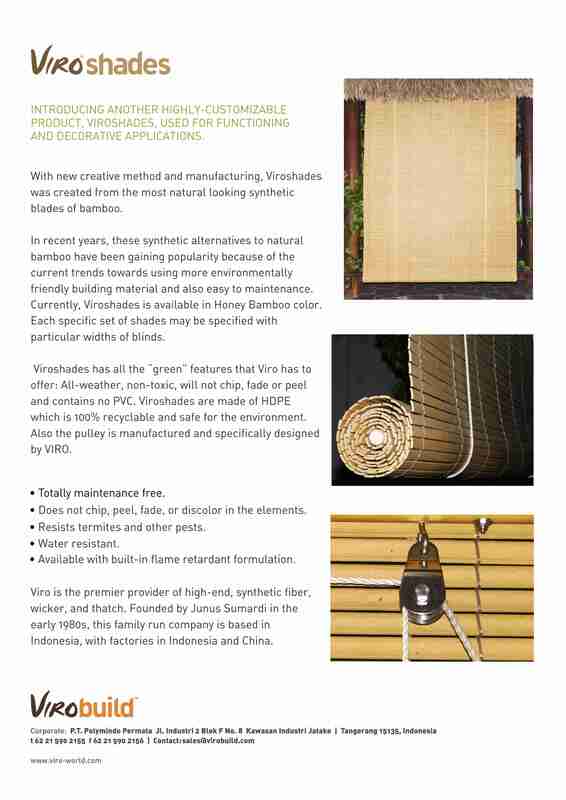 Viroshades has all the “green” features that Viro has to offer: All-weather, non-toxic, will not chip, fade or peel and contains no PVC. Viroshades are made of HDPE which is 100% recyclable and safe for the environment. Also the pulley is manufactured and specifically designed by VIRO. • Does not chip, peel, fade, or discolor in the elements. • Available with built-in flame retardant formulation.